For cancer survivors who successfully complete treatment, living with the fear of recurrence and facing an uncertain future are the greatest emotional challenges. Waiting for the next check up or having a simple headache or backache can unleash possibilities that send a survivor into an emotional tailspin. 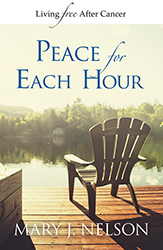 If you are one of the nearly 12 million cancer survivors in the United States today, or one of the two million women living on the other side of breast cancer, Peace for Each Hour offers hope, encouragement, and spiritual freedom. Instead of simply coping with life as a survivor, it will help you overcome fear so you can put cancer behind you and live victoriously. You will encounter God’s goodness in the aftermath of your health crisis, and learn to steward your healing so you can know your identity in Christ, walk in the freedom He won for you on the cross, and be empowered to live out your destiny.